Wake up to this Art Deco-style 38m²/409sq. ft room with high-speed internet access and partial city view. Catch up on work at the desk or take time off in the easy chair. Reinvigorate yourself in the bathroom with separate shower. King Hilton Guest Rooms have a sofa and separate working area with large desk. Indulge yourself in this Art Deco-style 37m²/398sq. ft room offering a seating area with sofa and a separate working area with large desk. Keep in touch with high-speed internet access and a daily newspaper or relax in the easy chair or on the sofa. Re-energize in the bathroom with separate shower. Enjoy a home from home with this Art Deco-style 55m²/592sq. ft suite offering a living room and separate working area. Surf the web with high-speed internet, get to work at the large desk or stretch out on the sofa. Relax in the bathroom with separate shower. Special touches include a daily newspaper. Business is a pleasure in this 38m²/409sq.ft room with large double-aspect windows offering city views and Executive Lounge access. Get to work at the desk or keep in touch with wireless internet access and newspapers. Relax on the sofa or reinvigorate in the luxury bathroom with walk-in shower. For extra space, upgrade to the 50m²/538sq.ft Executive Plus room. Surrounded by lush vegetation, this open-air Alexandria café is in the mall plaza at the Hilton Alexandria Green Plaza hotel. Try Lebanese mezze, a sandwich of freshly baked Arabian bread or the signature mixed grill. There's a pizza oven too. Accompany your meal with a coffee or local drink. Savour à la carte lunches and fill your plates at the Hilton Breakfast and dinner buffets in this informal Alexandria restaurant. Soft music accompanies your meal on the Hilton Alexandria Green Plaza hotel's 1st floor. Nightly themed buffets include seafood and Oriental. ample Italian dishes and pizzas at this poolside Alexandria restaurant. 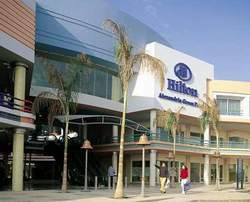 Locals join guests of the Hilton Alexandria Green Plaza hotel for a casual lunch or romantic dinner. Overlooking the mall plaza from this restaurant's terrace, choose from a selection of wines and enjoy live music at weekends.